5.56x45mm has been the bread and butter of the American infantryman for the last half century. With extremely high muzzle velocities in excess of 3,000 fps, on top of its small size and light weight, 5.56mm has become the cartridge of choice for many civilians shooters, law enforcement agencies, and militaries across the free world. Bullet weights are typically between 55 and 77 grains, with the lighter grain bullets being commonly used in shorter-barreled carbines such as the Mk 18, and the heavier bullets which are normally used in designated marksman rifles like the Mk 12. 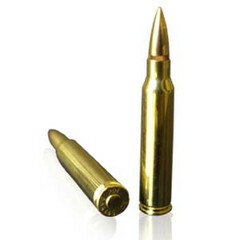 Bullet types also vary, from the 62-grain M855 ammunition with a steel penetrator for piercing light body armor, to the more modern Mk 318 “barrier blind” SOST (Special Operations Science & Technology) ammunition currently in use by SOCOM and the U.S. Marine Corps, or the 77 gr Sierra Match King in the Mk 262 used in designated marksman rifles, there are few jobs that 5.56mm cannot do effectively with the right bullet.